Wire EDM in NJ, NY, and PA. Located in Andover, New Jersey, Advantage EDM provides support services using wire electrical discharge (wire edm) for the following industries and applications: surgical devices, medical devices, aerospace manufacturing, defense manuafacturing, mold components, tool and die components, exotic metals, wire cutting, wire cut, air foils, refractory metal, tungsten, turbine vanes, titanium, traveling wire, electronics, aerospace, defense, energy, automotive, and nuclear. The process of wire electrical discharge machining (known as WEDM or wire EDM) offers many advantages which are unattainable using other methods. Over the last fifteen years, wire EDM technology has developed into a standard and popular machining technology. In many operations formerly performed by conventional manufacturing processes, the process of wire EDM is regularly less expensive, infinitely more accurate, and considerably time-saving. The question you have to consider, then, is could I realize time, quality, or cost benefits by utilizing wire EDM? Listed below are ten areas where wire EDM offers a distinct advantage for CNC production machine shops. This is not an exclusive list; it is simply intended to give you ideas and insights into the wide range of possibilities offered by wire EDM. 1. Exotic Metals Capabilities - Wire EDM process can cut any material that conducts electricity such as Inconel, Titanium, Hastelloy, Carbide and more. A simple geometry in other materials, such as a .030" wide, 3" long slot through 1" Inconel, is no longer a simple slot unless you are using wire EDM. 2. Complex Geometries - Wire EDM is especially beneficial when shapes such as splines, gears, and long thin slots are required. In the majority of these cases you have an excellent wire EDM candidate. 3. Stacking Plates - If your part can be wire cut from plate, multiple plates of specified material can be stacked and welded together to get multiple parts from one wire pass. For example: A complex spline shaped geometry is required from .250" thick Hastelloy. Hastelloy plates .250" thick can be stacked up to 10" high to produce 40 pieces from just one wire pass. 4. Racking of Parts - This application can be used when only a particular portion of your work piece needs a complex geometry wire cut into or through it. Example: A 2" square by .500 thick needs 20 .060 x .800 deep slots cut in one end. The part can be racked in a fixture to cut the configuration 20 pieces at a time. 5. Raw Materials - The ability to use raw materials in the condition it comes in from the mill saves time & money. Bar Stock, Plates, and Round Stock can all be used with very limited manpower to prepare it for the Wire EDM process. For example: A 500 piece order of components for an aerospace application has been determined to be an excellent candidate for the stacked plate method. Preparation for the job consists of blanchard grinding plates to finished thickness. The plates are welded together, one wire EDM start hole is drilled...and the job is ready. If conventional methods were used, this job would require 500 sawing operations, 500 squaring operations, and 500 milling operations - and that's just to get the job ready. 6. Hardness - The ability of wire cutting hardened or unhardened material is one of the many benefits of Wire EDM technology. Wire cutting can be done to parts with finished dimensions before or after heat treating. The hardness of the part does not affect our speed or ability in wire cutting the material. 7. Burr Free - Wire EDM eliminates secondary deburring operations, therefore creating a cost savings even before it leavges the designer's hands. 8. EDM Delivery - Production Wire EDM delivery is extremely fast since little or no tooling and fixturing is required in most cases. 9. CNC 5 Axis Wire Cutting Capability - Complex three dimensional programming systems enable us to independently control the top and bottom contour when wire cutting CNC 5 axis wire. Example: A 2" high part can have an octagonal shape on the top contour and a triangular shape on the bottom contour. At ADVANTAGE EDM, our large number of the latest generation Wire Electrical Discharge Machines, combined with our new large capacity Wire EDM (with a travel of 14.6" x 20.5" x 18" high) and our new large tapering Wire EDM (with a tapering capacity of 45 degrees), we are more than equipped to handle your high volume production quantities. This is an area where we truly do have the Advantage. 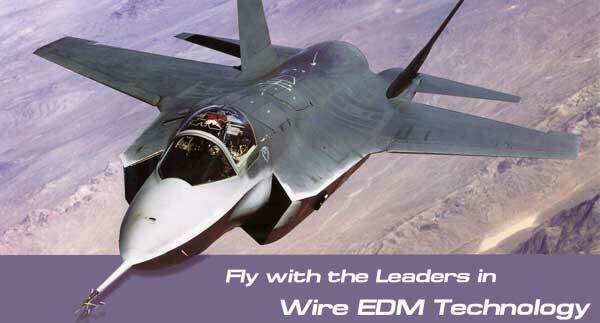 ADVANTAGE EDM is staffed only by highly skilled individuals. All of our EDM operators have extensive backgrounds in either tool and die making, mold making or precision machining. Our knowledge, along with the most accurate and productive Wire Electrical Discharge Machines available, make our precision tooling capabilities the best in the business. Complex ruled surfaces and advanced conic Wire EDM cuts can be achieved by individually programming upper and lower face contours. This technology provides ADVANTAGE EDM with the potential for handling new geometric design challenges. Cutting heights of up to 18" can be accommodated with a maximum work piece size of 33" x 27.3" x 18". Our new tapering capacity of 45 degrees exceeds the industry standard, making ADVANTAGE EDM a premiere Wire EDM facility.